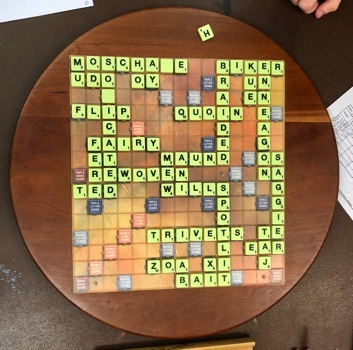 (April 21, 2019) 14 players were ready to play Scrabble in Asheville this Sunday afternoon! Kurt is not giving up on this game, and did suffer a little from running overtime today. Mike L. beat a priest on Easter! And he played SOONERS and REPEATER, both for 66. Jay started the afternoon with a win, and made high-scoring non-bingo plays like CARVE for 56 and LAX for 58! Mike B. finished off his day with a win, playing SPELUNKS for 64 and SQUIRM for 49. Xander had a mid-afternoon win and found GORIEST, TRAINING, and SOGGIEST. Lia chalked up two wins today, and she seems to smile, win or lose! Trish had two mid-afternoon wins, and of her four bingoes, she scored the most with ORDAINED. Leslie won half her games, and if I interpret correctly she had two bingoes in a row, then one that wouldn’t go down, and she noted “bingo, bango, non-go” and I must say I have never heard THAT before! I was 3-1 with 5 bingoes, with RESTAGE into a TWS yielding 80 points. ZAIDA and SHOWILY each scored 48. Jacob would have been 4-2, except he had a 420 high loss , meanwhile getting down 9 bingoes including unusual words like VARIOLES and RESMELT. Mark (4-1) had a good afternoon and played 10 bingoes in 5 games, including words like TAUTENED, ACARINE, and SCARTED, plus he got 55 points for the well-placed NAZIS! Aaron was 4-1, had a big 502 win, and got down 5 bingoes. Donna was also 4-1 with two games over 500 and 12 bingoes. Her high play of the day was a phoney for 112, but CASERNE gave her 90 points. Undefeated? David G (5-0) with 13 bingoes like ENDBRAIN, ROWELING, and PETALODY. The highest scoring game of the day was David’s 619, and his CLOQUE (82!) was the highest non-bingo play. Thanks for making the drive up from SC, David.